The 2019 Charity Calendar project has come to a close! With Teresa, there was NO question as to her love of Porsches, Porsche people, and Porsche passion; truly ‘It’s the people . . . not just the cars.’ Her smile said it all. Does that not sound like “T” ?? Photographer and project coordinator Michael Grabner has completed another stunning calendar for 2019. It was a tough year coordinating all the photo shoots with the owners and their cars, but everything came together and the presses started rolling out calendars in early December. Nord Stern has a goal to raise $8,000 for BGCTC this year. With Nord Stern members graciously snapping up the 2019 calendar months at the start of the project, the Club is on the way to making that goal. You can help with your purchase of a 2019 calendar and/or a direct donation using the links below. At the 2018 April business meeting raffle balls were drawn to determine winners of the prize pool. Grand Prize … Byron Jackson’s car is featured on the December page of the 2019 Charity Calendar. 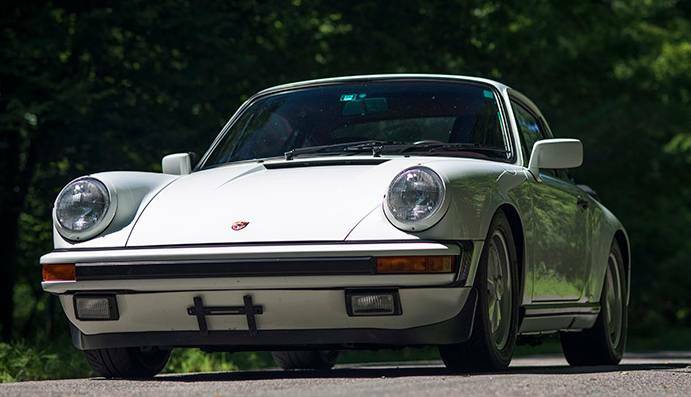 Runner Up … Courtesy of Morries’ Heritage Car Connection, Christopher Pickar received a rental day driving Teresa’s 1987 911 Carrera (pictured). Third Prize … A $100 Amazon gift card for David Kearn. Fourth Prize … A complimentary 2019 Charity Calendar for Todd Aldrich . Everyone who ordered a calendar should already be enjoying the work of Michael Grabner and the fabulous pictures of the cars belonging to Nord Stern members. Unfortunately, orders for the 2019 Calendar are no longer being taken. A project summary will be posted as soon as it is available.